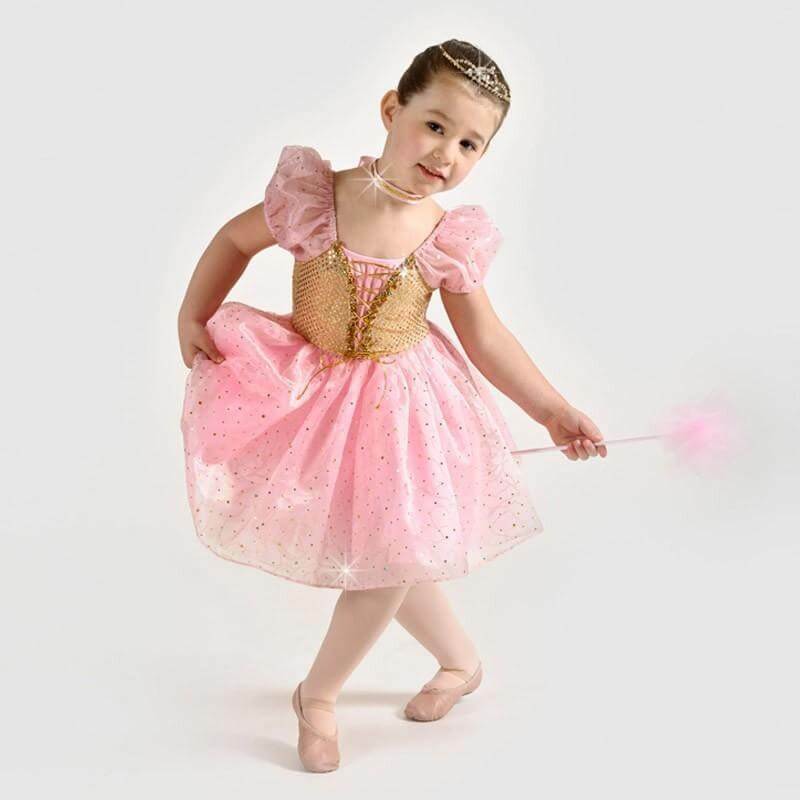 Latest women and children's Dance Dresses for sale online in a variety of styles from top dancewear brands. Double Platinum Girls Mesh Short Sleeve Dress DS657C: This versatile mesh cap sleeve dress features a scoop front and mid-length slits up each side for ease of movement while dancing. Wear over a bra and brief for a contemporary performance look, or pair over your favorite leotard. Dress is completely sheer and is not lined. Natalie Adult Short Sleeve Dress N8367: This short sleeve dress by Natalie features empire seaming, six gore paneled skirt, and an attached leotard. Shelf lining. Hand wash in cold water, hang dry. Natalie Adult Twist Back Lyrical Dress N8600: Natalie's elegant twist back lyrical dress is sure to float across the stage! Dress features a twist back, gathered front, an asymmetrical hemline, and an attached unitard. Natalie Child Twist Back Lyrical Dress N8600C: Natalie's child elegant twist back lyrical dress is sure to float across stage! Dress features twist back, beautiful shirred bust, an asymmetrical hemline, and an attached leotard. Reverence Womens Lace Performance Tank Dress RV2318: Be one-of-a-kind in this tank performance-ready dress featuring an allover lace, a single neck closure, an exposed back, a single horizontal back strap, skirt side slits, and attached briefs. Front applique is not included. Reverence Womens Open Front Cap Sleeve Performance Dress RV2429: Illuminate the stage in this beautiful performance-ready dress featuring a mock neck, cap sleeves, side sheer mesh inserts, a single neck closure, keyhole back, a sheer lower back mesh insert, an attached bustle style, open front skirt, and attached briefs. Dress does not include rhinestoned appliques. So Danca Girls Lace Back Tank Ballet Tutu Dress L1249: Charm the audience in this tank tutu dress featuring a scalloped lined lace front insert, empire seaming, a scalloped sheer mesh back insert, two-tier lace and tulle tutu, and attached briefs. 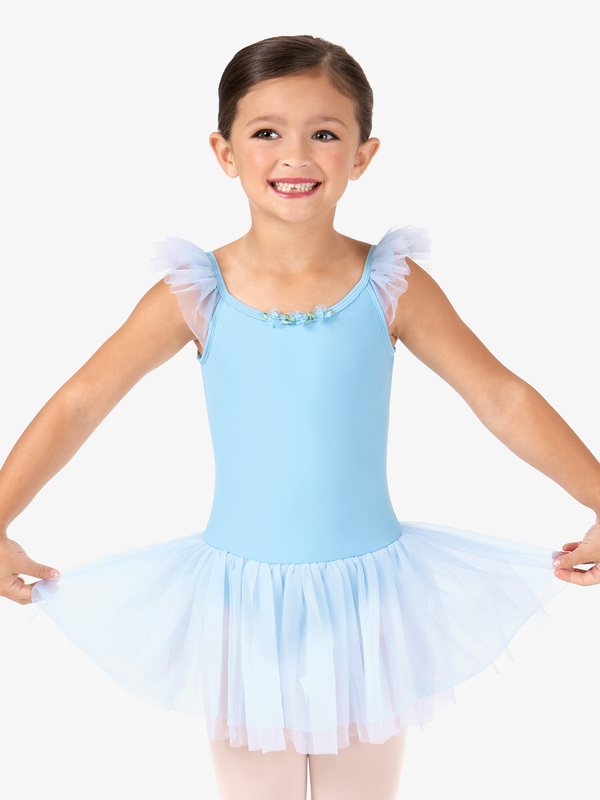 Theatricals Child Short Sleeve Dance Dress TH5105C: Short sleeve scoop neck dance dress has an attached three layer mesh tutu skirt, raglan sleeves, and rosettes at the neckline. Features a front bodice lining and a ballet cut leg line on the attached brief. 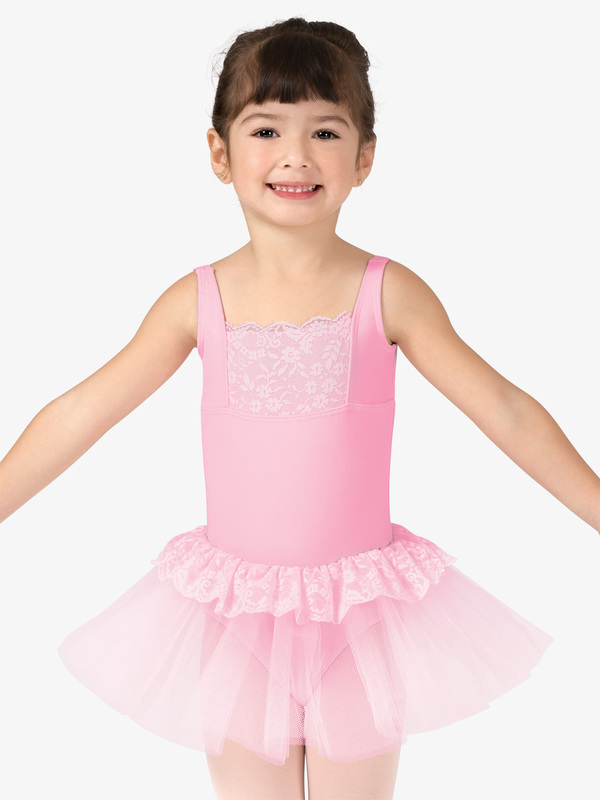 Theatricals Girls Ruffle Camisole Dance Dress TH5120C: This sweet camisole dress is a must-have for your little dancer! Features include delicate neckline ruffle detailing, empire seaming, bodice lining, a stretch mesh open sliced skirt, and an attached leotard with a ballet cut brief. Perfect for class or performance! Theatricals Girls Flutter Sleeve Dress TH5121C: Comfortable, easy to wear, and perfect for class! 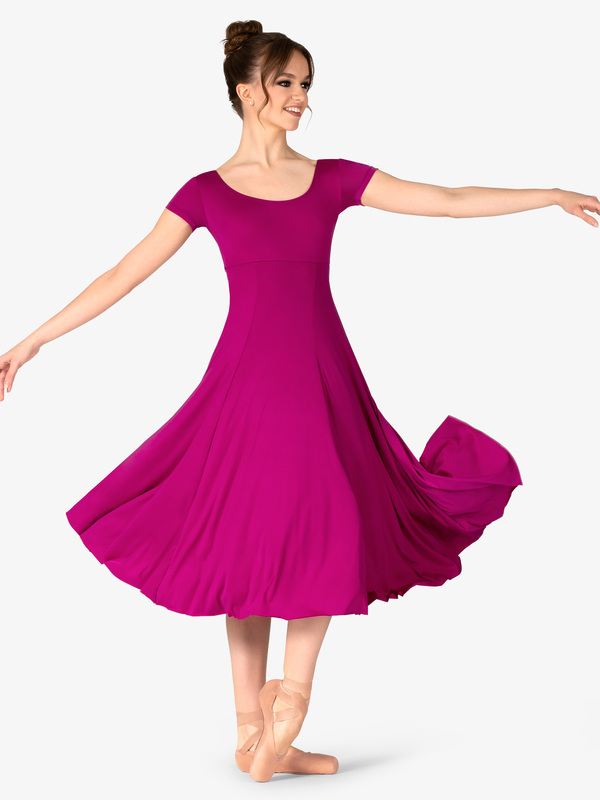 This adorable flutter sleeve ballet dress features camisole straps with delicate ruffles, a 2-layer chiffon skirt, bodice lining, and an attached ballet cut brief. Three petite flowers are sewn along the front neckline. Theatricals Girls Dance Dress TH5510C: This child short sleeve dress has an attached wrap-style mesh skirt, sheer ribbon bow, and rosette detail at the neckline. Also features a front bodice lining and a ballet cut leg line. Matching hair barrette is included! Balera Kids Camisole Dress With Skirt: This matte nylon/spandex camisole dress features a bow in back and an attached georgette skirt. Attached briefs. All sizes have a front bodice liner and crotch liner. Imported.Fabric : Nylon/Polyester/Spandex. Balera Kids Tank Dress Tiered Skirt: This tank-style dress features a high, scoop neckline with a rosette accent and a two-tone skirt. The skirt is constructed of two layers of tonal georgette. All sizes are fully lined in front. Imported.Fabric : Leotard: Matte Nylon/Spandex; Skirt: Polyester. Balera Two-Way Sequin Dress: This sensational, figure-flattering dress is made of Two-Way Ultra Sparkle sequin spandex featuring reversible sequins that show a different color on each side. The Premium Metallic front yoke and long sleeves highlight the cutout near the neck. With a built-in matte nylon/spandex biketard. Child sizes have a full front liner; adult sizes have a shelf bra. Imported.Fabric : Polyester/Nylon/Spandex. Balera Streak Lace Mock Neck Dress: A figure-flattering, bra-friendly dress constructed of streak lace over a matte nylon/spandex leotard. The mock neck attaches with a snap closure and creates a keyhole opening. Two matte nylon straps span the open lower back. Child sizes have a full front liner; adult sizes have shelf bra and crotch liner. Imported.Fabric : Nylon/Spandex.